The story of meek housewife Thelma (Geena Davis) and her independent friend Louise (Susan Sarandon) who embarked on a road trip that turned into a run from the law, took critics and audiences by storm in 1991. Not only was the story line a little radical for the time, it had two female lead characters who were slightly older than what Hollywood typically featured and a bold ending that many didn’t see coming. Check out the original trailer for a walk down memory lane. The film’s poster features Monument Valley and key scenes were filmed in the La Sal Mountain, Arches National Park and Canyonlands. The final scene which is supposed to take place in the Grand Canyon actually takes place at Dead Horse Point State Park in Utah. People flock to Southern Utah to take a “Thelma and Louise selfie” and even organize their own version of the infamous road trip with friends. Critic Roger Ebert reviewed the film, gave it 3 and a half stars and said, “When I saw the movie, about seven weeks ago, I reacted to it strongly. It had the kind of passion and energy I remembered from the rebel movies of the late ’60s and early ’70s.” Audiences can agree that ‘almost’ getting 4 stars from one of the most well respected critics is high praise and the mark of a great story. Thelma and Louise was and is a great story and one that was written at odd hours by a tenacious music video line producer. Callie Khouri was 30 at the time and had never written a screenplay. She was working in Los Angeles and after being the victim of two violent robberies channeled some of her personal experience and personality into the story. On a drive home one evening she had a stroke of clarity where the story of Thelma and Louise came to life. Khouri wrote the screenplay in her off hours and typed it out on her office computer during the day. All that hard work paid off. According to the Atlantic: In 1992, screenwriter Callie Khouri became one of a handful of women to win an Academy Award for best original screenplay, and Thelma & Louise earned more than $45 million at the U.S. box office. Sarandon and Davis were each nominated in the Best Actress category, and director Ridley Scott was nominated for Best Director. 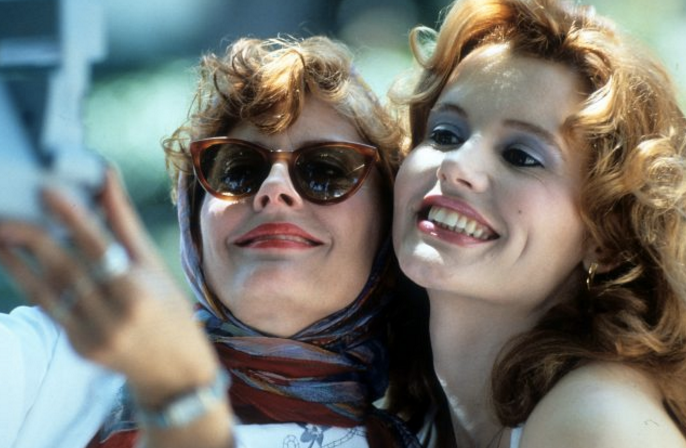 Thelma and Louise just celebrated its 25th anniversary in 2016 and Geena Davis and Susan Sarandon reflected on the impact and making of the film. The duo cover female representation in Hollywood, the surprise reactions to the film and some scoop on that infamous ending. For true fans this reunion will feel like having coffee with an old friend. And for people who just can’t believe the film ended the way it did, check out James Corden’s alternate endings to the film.